Voit nauttia kauniista auringonlaskuista ja tarkkailla valtamerialusten rahtilaivat rentoutuen pois Etukannella tämän kauniin, hiljainen, bungalow-tyyliin, 1300 neliömetrin, kaksi tarinaa mökki. Alhainen valosaastetta säädetään suuri tähti tuijottamisesta, koska ääni kuikkalinnuista ja St. Lawrence liplatusta rannalla laittaa hellästi uneen joka ilta. Runsaasti tilaa liikkua, ei tarvitse tuntea ahdas tai stressaantunut ovien tai ulos. Tehdä pitkiä kävelylenkkejä. Vuokrata tai laituri veneessä Cedar Point State Park parhaat hinnat, vain yksi puolen kilometrin päässä jalka tai puolitoista mailia autolla. Käy antiikkikauppoja, kirjakaupoista, tai hyviä ravintoloita lähellä keskustassa Clayton, Cape Vincent, Sackett Harbor, tai Alexandria Bay veneretkiä, kalastus, go-kart raitoja, golf ... you name it. JA kaiken tämän ei ole ylimääräisiä tai piilotettuja maksuja. Kaikki on käytettävissäsi, kun saavut. Ei tarvitse tarkistaa, mitä tarvitset (esim. Paperituotteet jne.) Ja sitten mennä kauppaan ostamaan sen.
Yläkerrassa kylpy on amme liukuva suihku ovet. Alakerrassa kylpy on 32 "X 48" askel suihku liukuovet. Kolme erillistä isompaa makuuhuonetta; kaksi yläkerrassa (13'10 'X 10'11 "); yksi queen-size bed & toisessa kaksi erillistä vuodetta. Yksi alakerrassa queen (13 "X 13 '). Ei ahdas runsaasti kaappitilaa. Pyyhkeet ja lakanat ovat tuoreita muuttuneet, ja vuoteet ovat ennen vieraiden saapumista. Deck kohti joen uudistettua vuonna 2013 kauden ja uudelleen maalattu 2017. Sisäänkäynnin kansi uudistettiin ja värjättiin vuoden 2017 kaudella. Enjoyed our stay immensely at this quaint cottage that provided all the amenities and peace and quiet that we were looking for! Sweet cottage with stunning views. Comfortable with everything you need for your vacation. 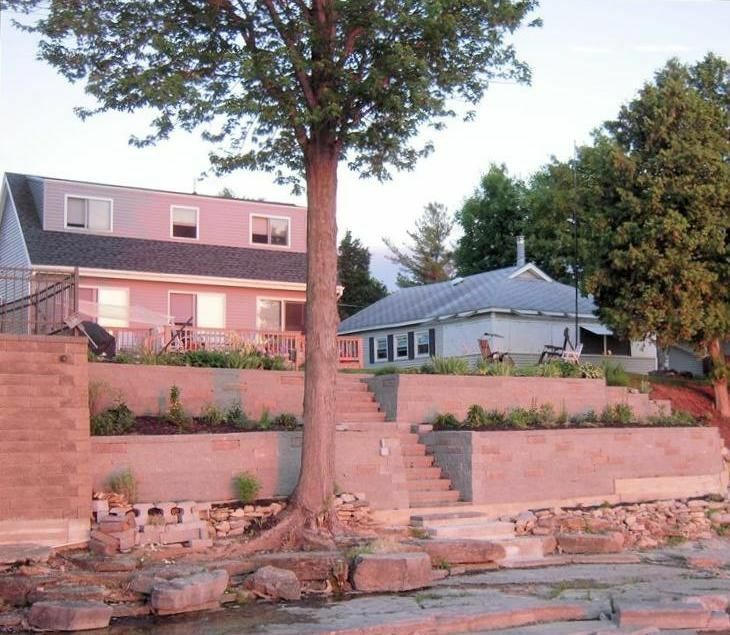 We had a wonderful week in the 1000 Islands while staying in this cottage. It’s right on the river and the views are stunning. The cottage had everything we needed from sheets and towels to pots and pans. It made it feel like home. The beds were comfortable and the cottage itself was well cared for. It was perfect for our small family (with a little room to spare). The owner even contacted us during our stay to check in and make sure everything was going well with our stay. The area is beautiful and one of my favorite places to be. We will be renting again next summer and I would highly recommend it to anyone. The whole experience was a positive one. Cottage was perfect. Well maintained and perfectly apportioned for our needs. We felt at home the minute we walked in. I would definitely come again. Our party of six thoroughly enjoyed every moment. The cottage was very clean and well kept up. All the paper products, hand soap, etc. Were there for our immediate use...no need to check out what was there to gave to go out and buy it before we could settle in. We have stayed at this property for the past many years and have always found that the owners have maintained and improved the property very well. We couldn't ask for a more accommodating owner. Five stars are too few. The cottage and view are more than one could ask for. Although the pictures provide you with an accurate description, the very clean Cottage offers so many amenities that you will be in awe. The view, especially early in the morning when the water is perfectly calm as glass, or the sunset on a clear night will impress you, calm you, and make you want to stay there forever. We were there late in the season and it was quiet on The River, but the weather cooperated and stayed in the 80's. We grilled and ate outdoors every day. We wore water shoes and went in The River multiple times throughout the day. It was very easy to just sit in a chair, stare out at the water and relax (zone out). The location is convenient to all things needed, but off of a dead-end road where there is very little traffic (if any other than those living next door). We absolutely plan on returning, if only our schedule would open up again in the near future. Thank you for sharing this beautiful home with everyone. There are no per night terms. Rentals are weekly; Saturday to Saturday. If arriving later than Saturday, then must vacate cottage on Saturday after arrival. There are no additional costs or fees; taxes & cleaning are included in the rental cost.